Impressively directed and superbly edited, this is a hugely enjoyable addition to the heartwarming competition-based documentary genre, with likeable characters, suspenseful competition sequences, a great soundtrack and an uplifting central message. Directed by Hugh and Anson Hartford, Ping Pong is a competition-based documentary that centres on eight competitors from six different countries as they prepare for the 2010 over-80s ping pong World Championships in China. In England, aphorism-spouting Les (89) lifts weights every day in preparation, while cancer-survivor Terry (81) hopes to be well enough to compete; in Germany 90 year old Ursula is persuaded to defend her title by her 60-something son, while her friend and doubles partner Inge (90), a relative late-comer to the game, also intends to compete; brash, big-haired Lisa (85), an Austrian who's moved to Texas prepares to take on all-comers, accompanied by her 65 year old gun enthusiast husband Joachim; in Stockholm, laid-back Swede Rune (85) muses on his chances; Inner Mongolian Sun Yong (80) supplements his extensive vitamin regime with smoking and drinking; and Australian Dorothy prepares to enter the competition at the ripe old age of 100. Hartford and Hartford follow the basic model of Spellbound, introducing all the characters individually (accompanied by a nice graphic where their flags and photos fit loosely into a grid) before pitting various combinations against each other at the Championships in Inner Mongolia. The ping pong sequences themselves are nicely handled and the Hartfords do a good job of sustaining tension by highlighting the match point of each game. It's a shame the film is only 80 minutes long, because you end up wanting to spend much more time with each of these characters. As such, there are a number of memorable moments, whether it's Terry jokingly asking the cameraman to lend him his lungs, Lisa's candid confession about her activities in the French resistance, Ursula pointing to a newspaper article about her that quotes her as saying “Young people are shitting themselves ...” or Dorothy's comeback to a badly phrased question from a Chinese journalist. What really emerges from the film is a strong sense of the importance of ping pong in the lives of these people, giving each of them a focus and something to strive towards. 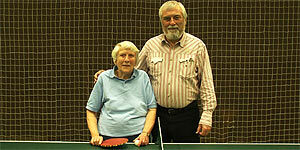 This is particularly true in the case of Inge, who took up ping pong after ill-health and a stroke in her 80s and seems to have been revitalised by the game. On top of that, the film is beautifully shot and edited, with crisp, colourful camerawork and a lively sense of pace. There's also a terrific soundtrack that works in both some appropriately uplifting songs and a catchy score that incorporates the sound of bouncing ping pong balls. Ping Pong is a hugely enjoyable feel-good documentary with engaging characters and an inspirational central message. Highly recommended.